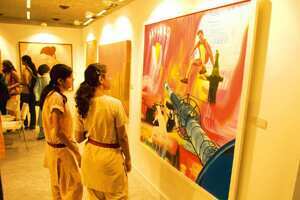 New Delhi: Indian art might be just the solution for investors seeking a safe haven in turbulent times. Take a vivid landscape by avant-garde artist Francis Newton Souza hanging on a wall in Indian art dealer Ashish Anand’s New Delhi gallery. With a price tag of $400,000 (Rs1.8 crore), the painting might not seem like a bargain but Anand says it will probably be worth $2 million within the next two years. Art dealers and experts say the Indian art market is still undervalued and there is money to be made in local art for those with the means to pay the six figure prices that works by some of India’s leading artists fetch at auctions. “I think Indian art is a one-way bet in the long term " said Philip Hoffman who runs the Fine Art Fund based in London. “If you look 50 years down the line, what you pay now is peanuts compared to what you will have to pay for the great Indian artists," he said at an Indian art summit in New Delhi in August. The prices of Indian art have gone up considerably but not at the levels of Chinese art, which has seen prices soar due to enormous interest at home and abroad. Indian art has long been popular among wealthy Indians. Until recently, Western collectors had not taken much interest in Indian art. That is starting to change. As South Asian art begins to draw a Western audience, dealers believe Indian works have plenty of room to appreciate. Weihe predicts that sales of Indian art at Christie’s auctions might reach $30 million this year, compared with $680,000 in 2000. Asia’s art scene has blossomed in the past five years driven by the continent’s rapid economic growth. Valuations have skyrocketed as Asian art has become an investment for speculators and a symbol of affluence for a growing pool of local collectors. The record for a contemporary Indian art work was set in June when Francis Newton Souza’s piece Birth was sold for £1.3 million (Rs10.8 crore). The figure was, nevertheless, significantly lower than the $9.7 million record price for Chinese artist Zeng Fanzhi’s piece Mask Series 1996 No. 6 sold at an auction in Hong Kong in May. Works by famous Indian artists such as Maqbool Fida Husain and Syed Haider Raza currently go under the hammer for anywhere from $200,000 to $1 million. Yet industry players expect prices to shoot up to between $5 million and $10 million in the next few years. Neville Tuli, a manager of a $400 million art fund in India, believes that Indian art will appreciate by between 18% and 25% per year in an economic climate in which art is increasingly seen as a secure investment. “Financial institutions and their HNIs (high net worth individuals) are recognizing the inherent stability in the art object as a capital asset," said Tuli. “Hence given its low correlation to economic circumstances and other related factors, the proportion of art within the alternative asset allocation is increasing significantly," he added. But, as with all investments, there are risks. The Indian market is vastly different from the Western art markets because in India, art is viewed more as a financial investment rather than a collectors item, art fund managers said. “It has gone up 200 times in five years," said Hoffman, of the London-based Fine Art Fund, adding that the Indian market consisted of 70% speculators and 30% collectors. This trend of rapid buying and selling, makes it difficult to predict long term value. “Let’s say you’ve got a Gupta," Hoffman said, referring to Subodh Gupta, one of India’s hot new artists whose pieces sell for between $800,000 and $1 million. “It’s a financial commodity like a stock," Hoffman said. “You need the Bill Gates’ of this world to say I want a Gupta and I don’t give a damn how much it costs. It’s going into my collection and it’s not for sale," he added. saying a growing pool of collectors will stabilize the art market. Also, greater government investment in art infrastructure and museums will give the market stability in the long term, experts said, although they noted that so far the Indian government has shown little political will to support such projects. There are also bureaucratic hurdles such as permits to export works of art and requirements to register antiques with government bodies that turn acquisitions of Indian art into a headache for dealers and collectors abroad. Despite the market’s shortcomings, art dealers, Weihe and Hoffman are bullish on Indian art. “The Indian market will mature when the real collector base is grown up and the money is put to one side," Hoffman said. “In the long run, all these artists are going to be global, they just happen to be local at the moment."